Eight minutes after the detonation of Gilda at Bikini Atoll on July 1, 1946, a fleet of U.S. B-17 Flying Fortresses and F6F Hellcat fighters approached the rising mushroom cloud. The first B-17 entered the cloud at 24,000 feet and, minutes later, three more B-17s and three Hellcats also passed through the cloud at varying altitudes. The aircraft, leftovers from the Second World War, were completely empty save for the radiological sampling and photographic equipment that would be used to gather data from the test. They were controlled remotely by pilots in a nearby control plane and flown directly into the toxic cloud. It was the first in a series of military experiments pairing drones and nuclear weapons, creating a legacy that lasts to this day. In the months leading up to Operation Crossroads in July 1946, the first of the nuclear tests in the Marshall Islands, the military touted the role that drones would play in the test. In February 1946, Vice Admiral William H.P. 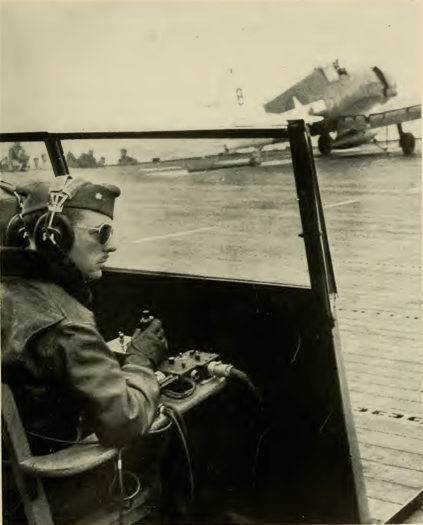 Blandy, the commander of Crossroads, told the New York Times that “The use of drones is expected to uncover facts of the radioactive phenomena as well as supply data on blast effects on airborne aircraft.” Other articles in the Times described how the F6F Hellcats were to be launched remotely from aircraft carrier USS Shangri-La—a difficult task even with a pilot on board—and in an April 17 press conference, Maj. Gen. W.E. Kepner, the deputy commander of aviation for the operation, explained how the “mother planes” would control the B-17 drones from miles outside the target area. Most of the drones that entered the mushroom cloud emerged relatively unscathed. 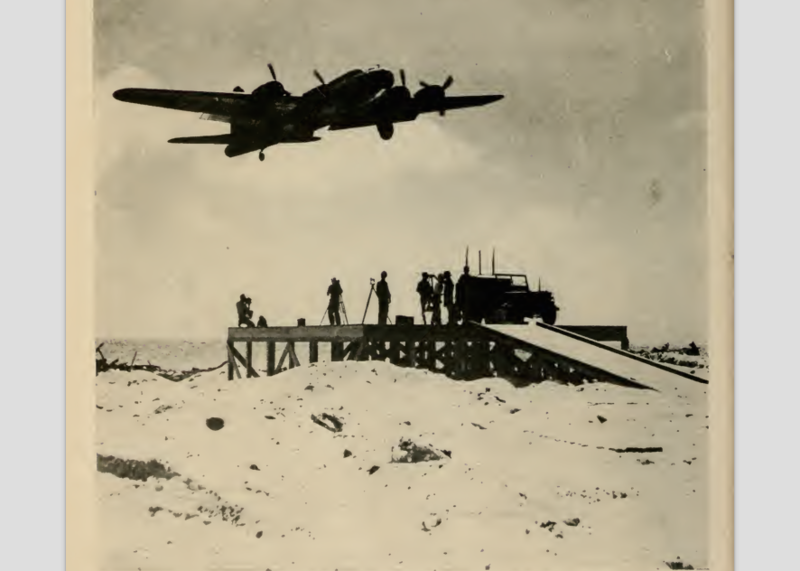 One B-17 was damaged when it overshot the runway during a landing. At another point, the pilots of one of the Hellcat control planes lost communication with the little fighter, causing it to fly off into the distance. Following the test, one of the normally red Hellcats emerged from the cloud at 15,000 feet covered in ice and completely white. One control plane nearly met with disaster when the pilots mistakenly flew too close to the billowing cloud; “The cloud kept right behind me, billowing out, until I finally pulled away,” Lt. Cmdr. B.C. Kay said in an interview with the New York Times. On the whole, Operation Crossroads was considered a huge success for drones. In “Bombs at Bikini,” the official report of the operation, the authors reflected that the remote-controlled flights “advanced the science of drone-plane operations by a year or more.” This wasn’t the first American attempt to fly drones. Some programs, like the Radioplane drones that provided aerial targets for Navy gunners, were already proving to be incredibly successful. Other attempts, like the 1944 Operation Aphrodite, in which the U.S. tried to remotely pilot B-17s loaded with explosives into German V-weapon sites, ended in catastrophic failure. In the public imagination, however, Operation Crossroads was a convincing illustration of the new age of warfare. Other drone events contributed to this belief. On August 6, 1946, two of the B-17 drones that participated in Crossroads successfully completed the 2,174-mile journey from Hawaii to California, setting a new record for longest unmanned flight. Weeks later, a lengthy article in the Times by Hanson W. Baldwin trumpeted the drone as a “portent of push-button war” that would soon be a “familiar sight in the skyways of the world.” Baldwin envisioned that fleets of drones controlled by a mothership could disable enemy air defenses or, when outfitted with automatic and infrared cameras, conduct low-level reconnaissance and surveillance. Drones continued to be used in successive tests of nuclear weapons. During Operation Sandstone, the third after Crossroads in the series of U.S. nuclear weapons tests between 1945 and 1948, B-17 drones were flown into three of the explosions carrying sampling equipment to test radiation levels. For those tests, a specialized drone unit known as Task Unit 7.4.2 consisting of 460 men from the Experimental Guided Missiles Group at Eglin Field, Florida was created to operate the drones and retrieve the sampling material. 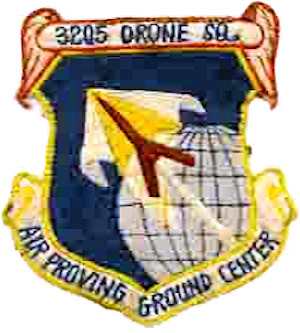 On April 26, 1950, the Air Force created the 3205th Drone Squadron at Eglin Field, which for thirteen years provided drones—decommissioned manned aircraft—for missile and nuclear weapons tests. Eventually, in a push to replace the aging B-17s with faster aircraft, the Air Force began converting began converting jet-powered Lockheed F-80 Shooting Stars into drones (known as QF-80) under a program known as “Bad Boy.” During some tests, like Operation Upshot-Knothole in 1953, live monkeys and mice were placed onboard the QF-80 drones in order to test the hazards posed by radiation to personnel. During Operation Teapot, a nuclear experiment at the Nevada Test Site in 1955, the 3205th Drone Squadron relocated to Indian Springs, Nevada, currently the home to U.S. Predator and Reaper drone operations at Creech Air Force Base. At the same time that drones were playing a larger role in testing the effects of nuclear weapons, some within the Pentagon envisioned that drones might be useful in actually delivering the bomb. Military planners feared that the strength of the nuclear explosion would be too great for any of the bomber crews that dropped the devices to survive. In 1949, the Air Force created Project Brass Ring, which proposed using a remotely-controlled Boeing B-47 Stratojet bomber to deliver the bomb. Like the failed Operation Aphrodite during the Second World War, one of the ideas behind Brass Ring was that the crew of one bomb-carrying B-47 would bail out before reaching the target while the crew of a second manned B-47 would pilot it into the target. The project was cancelled in 1953 after military scientists concluded that, contrary to earlier assumptions, the nuclear explosions posed little threat to the bomber crew. In the following years, drone development turned away from nuclear weapons and toward surveillance and reconnaissance. In the 1960’s, small reconnaissance drones were used by the Air Force extensively in the Vietnam War and by the Central Intelligence Agency to conduct spy flights over China. The Air Force would eventually ditch the name “drone” in favor of “remotely piloted aircraft,” perhaps in acknowledgement of how far the technology had progressed since the jerry-rigged B-17s and QF-80s used in the nuclear tests. Nevertheless, these tests demonstrate how the U.S. military’s fascination with the idea of remote-controlled warfare once extended far beyond surveillance and strike operations. The chapter on Project Brass Ring from A History of the Air Force Atomic Energy Program: 1943–1953.